When I was hired by Jelsoft back in 2001, the first thing I did was to make some sweeping changes to the vBulletin 2 style in time for its fourth beta release, though many of the design elements were already in place and could not be re-done without major changes to the PHP code. For vBulletin 3, the task of producing the style once again fell to me. My goal was to simplify the layout, produce consistent design rules, to make commonly-used controls more prominent and to take those less-frequently used buttons and links and do the opposite through the use of popup menus, collapsible elements etc. The vB3 blog and project tools add-ons were largely my design, and for these products we started to explore the use of tableless / CSS design in more depth than was in use for forum. 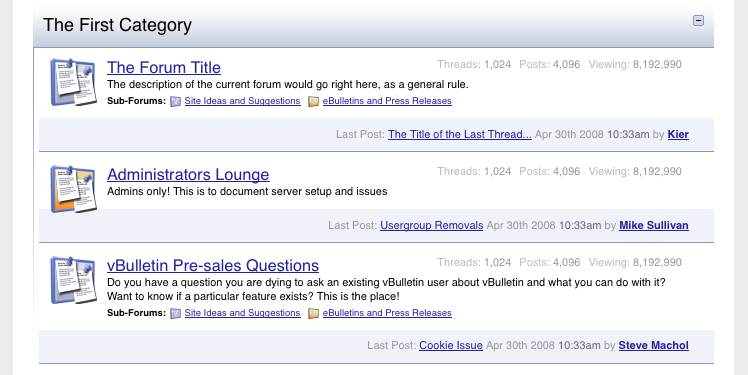 With vBulletin 3.7, the new profile page, album/picture system and social groups were designed to be completely CSS-driven, but they clearly showed the limitations of trying to append additional CSS rules on top of the existing CSS written out by the vB3 style system, which is far from conducive to producing a completely CSS-driven design. For vBulletin 4.0, the original intention had been to produce a completely new, CSS-driven design, marked up with semantic XHTML together with an overhauled, much more modern user interface. All of this would be released in a single 4.0 version with a relatively long project timeline. However, the switch to the new iterative development strategy, together with the much shorter period to first release that came with it, has meant that the scope of this task has been pared back for 4.0. In the initial release, the requirement is to produce a new design using semantic XHTML and CSS on top of the improved style variable system and extended template syntax that has been developed. The more extensive user interface changes will be delivered in a later release, after 4.0. It must be capable of adapting to elements being conditionally available due to permissions, options etc. I have been working on this for some time now and have developed a CSS framework within which the new templates can be produced, together with several key pages to demonstrate how it all fits together. The process has reached the point now where some of the work can (and for reasons of time constraints, must) be handed off to people other than just me in order to complete everything that still needs to be done. I figured therefore that now would be good time to demonstrate some of what I have put together so far. Let's start with the top of the page, with the header, navbar, breadcrumb and page title. Some things to mention right away: the tabs in the navbar are currently non-functional and the links underneath are just place-holders. The actual content for these has yet to be decided. Secondly, you'll notice that the colour scheme in use is not a million miles away from that of the existing, vBulletin 3.x style. This was a conscious decision in order to retain some visual familiarity with the scheme that has been in place for so long now. By default, we show a very small logo in the header, which can of course be replaced with something of equal or different size to fit in with the branding of your own site in the same way as was possible with all previous versions of vBulletin. Under the logo, we have (and hope to retain, given time to complete the PHP code that would allow it to function) a set of tabs that will allow the visitor to quickly navigate to a section of the system and know at a glance where they are. Below this we have a row of links similar to what runs along the bottom of the vB3 navbar, except that these links have the ability to switch depending upon the selected tab above. Moving down we see that the breadcrumb has moved out of its traditional position in the navbar to occupy its own space on the page background where it is less cluttered and less likely to wrap with small browser windows. Immediately below the breadcrumb is the page title. The size of this element has been vastly increased over the bold, 10pt text used in vBulletin 3 and is far more prominent in its placing on the page, as befits its importance. Under this is space for an optional page description, which can accept a forum description, help text or anything else that might be useful. Welcome to The New vBulletin Style Forums. The forum home page was the first complete page I built, and looking back at it now there are some bits of it that look a little out-of-place next to some of the more recent design elements I've built. Right now, it's using the same iconography as vBulletin 3, though I have produced new, larger versions of the images with alpha transparency from my original masters so they work a lot better on variable backgrounds. 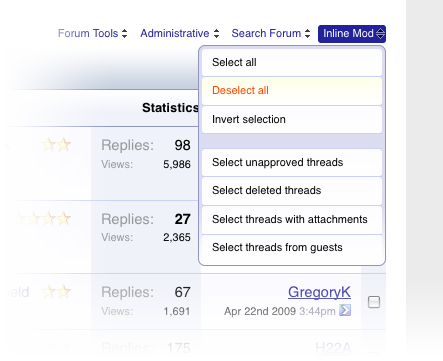 As you can see, the forumbits have moved on from their column-based layout that was used in vB1, vB2 and vB3. The new design is less rigid and allows whitespace to imply connections between data items rather than enforcing encapsulation with heavy borders or backgrounds. 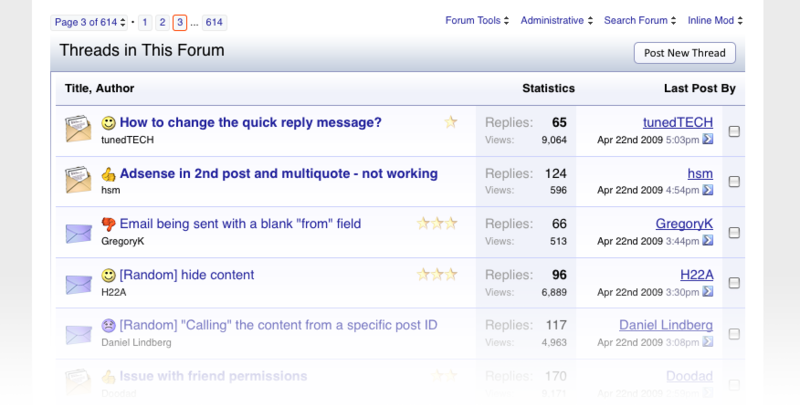 Forum titles and icons are made much larger and more prominent, as these are the primary points of reference for the forums. Information such as the number of contained threads and posts is demoted to a floating line of de-emphasized data to the right of the title while last post information gets a line all to itself in order to allow thread titles to be shown without the excessive wrapping that would invariably come from the small container available in vB3. As we look toward the bottom of the page, the What's Going On box has been given a make-over. Once again, this design is accomplished with minimal markup (it's primarily a bunch of HTML list elements) and all the layout and styling is accomplished via CSS. The threadbit element of forumdisplay has already been revealed in my previous blog, so I won't go into it in much detail here, but there are a few new elements on this page that are worth a closer look. Additionally, these new menus keep their content associated with the control, meaning that one does not have to go hunting through the XHTML for the body of the menu. The button-bases that were produced for vBulletin 3 were never very popular. The fact that they were a fixed colour, and that they were anti-aliased to the default style's background colours meant that they were not particularly flexible, and required a trip to the image editor with the graphics developer toolkit in order to make them appear nicely on different coloured backgrounds. For vBulletin 4, I have abandoned image-based button-bases completely in favour of CSS-based styling of standard textual hyperlinks. Gecko (Firefox) and Webkit (Safari, Chrome) based browsers can benefit from CSS-driven corner rounding while all modern browsers can make use of alpha-transparent PNG button backgrounds for a polished appearance. In some cases, graphics will still be used in buttons, but only to provide an iconic symbol in addition to the text, rather than to provide the entirety of the button. When these icons are used, they will be alpha-transparent PNGs so that they work on any coloured button background, meaning that it will be far easier to produce buttons and controls for varying colours of vB4 style than ever before. Very nice, clean and professional look. Much better calendar look too. Would be nice if you could create and event and not be forced to have an end time (recurring event). I want these buttons I want this design. Kier come back ! Stunning. This is what I want, not what came with the Gold release Where can I get this? All times are GMT-8. This page was generated at 5:37am.